Thanks for my bills, the three grand one arrived first, fractured the concrete under my letter box – ha ha! I didn’t pay them immediately, – you know me, such a joker, I love that ‘pay up or we put you out of business letter’ ha ha ha ha, -you know? The one you send three days later. Brilliant! Think more government agencies should adopt your ‘licences revoked’ angle -refreshing and direct. No more fumbling about..well done on bringing that one in. Make sure you don’t send it to Ladbrokes though – that WOULD be a blunder!! We had some fun in the office trying your ‘fees calculator’ on the GC website – but the numbers it came up with seemed so fantastic I was sure I’d pressed the button which said I was ‘Betfair’. How we laughed! How do you get away with it? Anyways, I called your executioners about the ‘we’ll put you out of business’ letter, they told me not to worry, ‘we always do that with the small fry’ – and I wasn’t to take it too personally. What nice guys, I’d already called the job centre! Things have gotten a bit complex this year- all the new licenses and fees I have to pay. 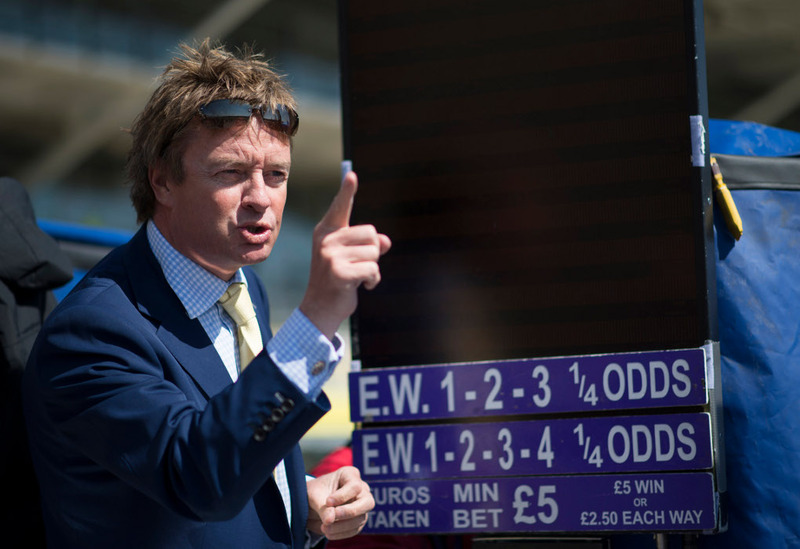 And the forms – you know the ones that asked me if I lay wagers to 9 year old drunks, and what colour my servers are, and whether I took ‘bets’ – that sort of thing! Anyways, I worked out i’d need three different licenses, a HC45 ‘small fish off track non casino’, a P45 ‘Racecourse arber’ Special, and a UB40 for the website Phew! I must say how impressed I am by the whole process, how complex you’ve made it, and how many people I’ve had to ask what a ‘transitional license’ was. Little did I know it’s a vehicle to charge me another grand! Fell for the old trick heh! Excuse if I make the distinction between independent and major betting chain, they seem to do so well out of the whole deal. 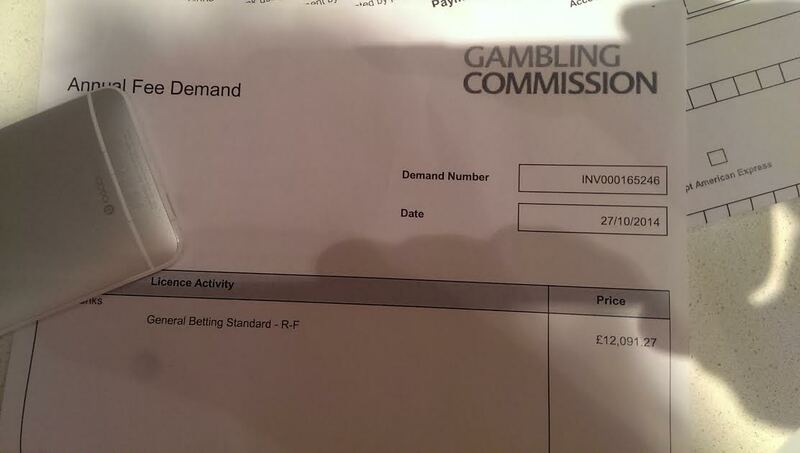 I pay 10% of William Hill’s fees for my little website?? I hear you’ve been screwing the small shop operator with a similarly penal rate in comparison to the multiples, ten times the fee for a little guy? 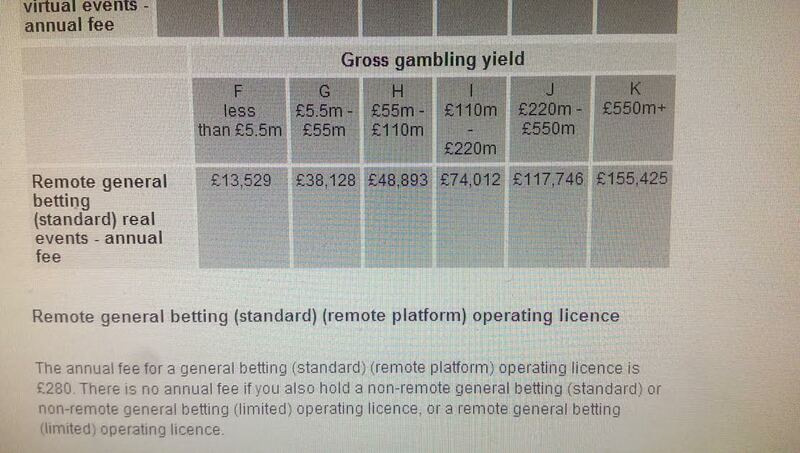 I wonder if the DCMS sat down with the big bookies to work out the fee structure? I hope so. I see those bad boys Bet365 have absconded their whole shooting match to the wonder rock, even after point of consumption. Terrified of inquiries into their activities in the grey market? I hope you get them good and proper of course, and bang up that Ray Winstone for life. He gets on my nerves. ‘Mmmmmmm tasty..’ Not as squeaky clean as we thought that mob! Anyway, I digress. How relieved I was to hear the thump of another envelope land on my mat with a bill for £13500 for the website – brings me up to sixteen grand, price of a small family hatchback ha ha! You guys are amazing!. Just dock it from my Diners Club and I’ll joyfully spend the air miles on a trip to Shanghai. Do you know anyone else who gets away with billing small firms sixteen grand’s worth of licensing fees? What’s even better? According to this, my online business is worth 11% of super goliaths William Hill! I’m off to the City in the morning to pop the firm onto the stock exchange and really start coining it in. What a lucky guy! It’s a bit like the shop bookies paying TEN times in fees than the multiples pay, we’ve all got to do our bit to keep you in work! I must say how upset I was to see you getting lamped by those grubby MP’s on that select committee thingy. Horrid little men, Damian Collins and that awful Philip Davies, the Conservatives attack dog, questioning on what it is you ACTUALLY do apart from make us waste days of our lives filling out forms? What a disgraceful slur. You were quite right to front it out over your wages, people don’t realise how hard it is for a gal to scrape by on £170 grand a year. Especially when you turned down a three grand bonus. I felt quite choked when I heard! Well done there. Don’t panic, I doubt they’ve any clout with the minister. He doesn’t mind wasting money- if it’s just Bookie money! Quite right to dig your stillettos in over fee structure hun, independent firms are a pain in the proverbials. You have to visit them every three years or so, drink their coffee, make sure they fill out their forms. That kind of stuff. Invoicing them must be a nightmare! I hear some of them ask to pay their fees in instalments? Ruddy cheek! Good news though, the little guys dropped by 17% last year (seems a lot?) – gobbled up by William Hill and their mates. Any luck there won’t be an independant about in 5 years, now you’ve helped put them out of their livelihood. After all, it’s clearly not your job to help them stay in business is it? I don’t think anyone properly appreciates how great you’ve been- running about trying to find people in shops with a gambling problem. A bit like walking into a pub and asking anyone if they’ve a drink issue.. Little surprise you found 0.4% of gamblers declaring they ‘had a problem’ with betting, playing the fruit machines! May I ask were they the ones wearing dog collars? Anyways, you’re doing a great job encouraging the proliferation of gambling adverts on the telly..
btw love the whole self exclusion idea- you know where they say they have a problem – then bet down the road? Brilliant..so many innovations! I had some fellah down the pub, rambling on about backing a horse that had already fallen on the exchange, I mean so what eh? All those fellahs sitting in trading rooms at racetracks investing upwards of a hundred grand in software on their ‘hobby’. People have to have their fun – isn’t that what gambling’s all about ? I backed this horse like and it had fallen and broken its neck but i got 999/1 on it, did I think it was a value punt? Some people call it fraud on a grand scale, backing things that are already out the race? They need to read the small print! Anyway, I’ve taken too much of your time, about £4800 worth I calculate whilst I drone on. I thought I’d write a letter to remind you I’m a bit miffed I keep sending you money which you bank and I only see your inspectors once every five years no doubt I can expect a snap inspection!! Ha ha ha ha! I’ll get that cheque in the post – right pronto this time! ha ha ha ha ha ha ha. I know a lot of operators take the view your defence of the ridiculous fees you charge is merely to preserve your sad little regulatory existence. Strange paradox, the companies you are supposed to defend us from, those who bombard us with constant advertising encouraging us that casino gaming and the like is the new utopia, the companies who avoid taxes and regulation in Gibraltar havens, who do business with states like China, in contravention to their laws are the ones you charge the least to regulate.